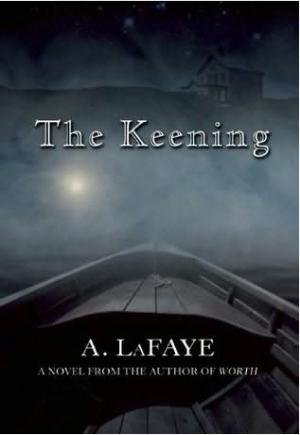 A. LaFaye’s The Keening is one part poem, and one part novel. Though the narrative is strong, it is the layered, considered language, and the dance with fantasy that make this novel something special. Both a modern-day ghost story and young adult novel, the book is complex, something that can’t be tied to just one genre. This book’s protagonist, Lyza, lives with her father on the fringe of a Maine fishing village. With the family’s feet dug deep into fantasy and another foot tipped towards reality, the village doesn’t quite understand them. After her mother’s death from the 1918 influenza epidemic, Lyza has to decide whether she will head to Portland to take a college examination or stay and save her father from those who do not understand his obsessions. Like many teenagers, Lyza is unsure of her place in the world. Often, she feels as though she has been “orphaned” from her family’s talents and creativity: her mother’s knack for sewing and her father’s carvings. This feeling of otherness or isolation is not helped by her oddball parents who are content to live away from the village. Mater and Pater, as Lyza calls them, do not care that the town ostracizes them or that they are talked about. They are comfortable in their world of sewing, carving, and creation. Once her mother passes, Lyza’s search for her identity intertwines with the plight to save her father from being institutionalized. Soon, she taps into her family’s heritage and sees the souls in her father’s wood carvings. Like many children who shy away from the thing that makes them different, Lyza realizes that she is not unlike her father, her talents are otherworldly, and that much will need to be done to mend the wounds between her mother’s family, her father, and the different worlds between which she is caught. The joy of this book is when the descriptions are subtle yet layered. The characterization in this novel is punctuated by sharp descriptions. For example, LaFaye writes “...Mater liked her meals with the tides—breaking her fast as it went out, setting down to supper when it came in, preferring to eat as gulls do between times—pecking at this or that...” In just a few sentences, Mater’s personality is chiseled to perfection. If there is a misstep to the novel, it is its ending. Here, the speaker tries to wrap up each string or piece of the future: mentioning “the staircase leading up the cliff to home. To college. To anywhere the spirits and the Good Lord cared to lead me.” The final sections of the novel explain too much: The speaker’s realizations about paths—whether or not Kingsley Cove could be emptied out—seem too loud for such a dream-focused novel. The strength of the novel is diluted when the speaker puts her feet on the ground. It’s moments like when Lyza’s Pater looks up and sees “angels in meteors” or when the writer describes her friend, Jake, and his inability to stand up to his father as “folding like a church lady’s fan” that this novel shines. The poetry in this novel is sharp and layered like Pater’s wood carvings. When Lyza finally learns not to “trip over her talent,” it’s like the glow of a lantern on a dark day. Soon, Lyza learns that if she paddles long enough, keeps her eyes, mind, and heart open, and listens to what’s around her, the shore is sure to come. Thank you so much for your thoughtful and articulate review of THE KEENING. I loved your description of the novel as "one part poetry, one part novel"-- I definitely toyed with boundary distinctions in this novel. I'm glad it shows. You just made my day/night! I'm still thinking about your book and its layered language: what poetry. Made me sigh out loud like I do at poetry readings. Tidbit: I earned my BA and MFA in Creative Writing from Hollins (a bird -- Google -- told me you taught there).